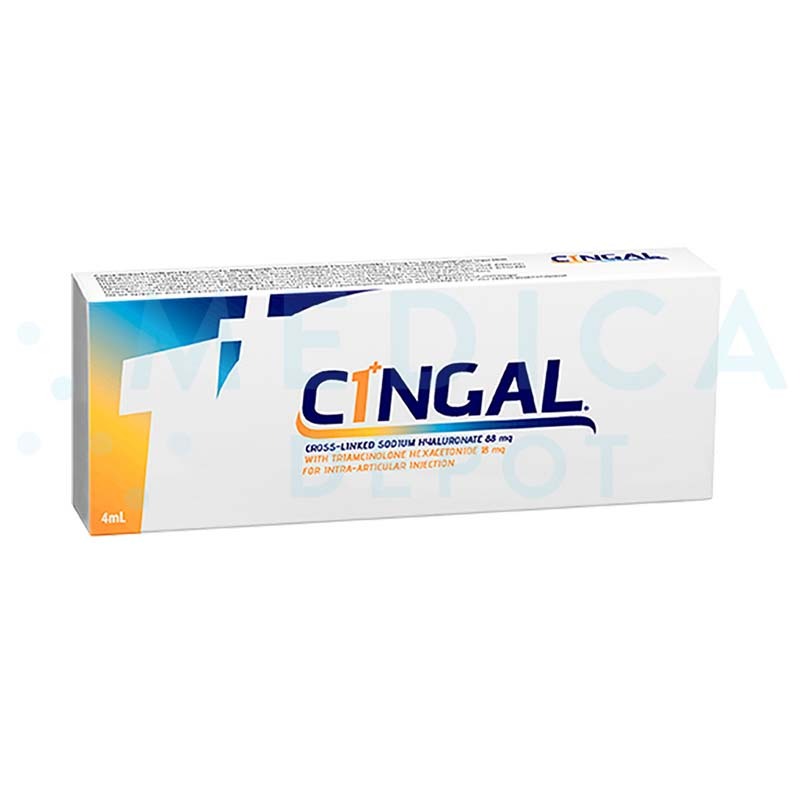 Cingal is a prescription medication that indicated for treating pain associated with knee osteoarthritis. Cingal is administered in just one session, negating the need for multiple visits to the doctor. Cingal is a treatment for knee osteoarthritis. You can order Cingal online from MedicaDepot.com, or you can call our friendly customer service associates to place an order of it. Cingal is supplied in a 5ml prefilled syringe that contains a 4ml treatment dose. Cingal is supplied sterile and is non-pyrogenic. The syringe components are latex-free. Cingal combines viscosupplementation and a steroid injection into a single medication. Treatment with Cingal is clinically proven to result in rapid and long-lasting pain relief. Additionally, the treatment is administered in just one single dose for ease and convenience. Cingal has demonstrated a good safety profile, good tolerability with in the body, and is associated with a low risk of complications. Synovial fluid is a viscous, thick liquid that reduces friction and provides a degree of shock absorption for the synovial joint, thereby preventing damage. Patients with osteoarthritis of the knee have unhealthy synovial fluid that has a more liquid texture and, hence, has lost its capacity to lubricate and cushion the joint effectively. These patients also have reduced amounts of synovial fluid overall. Taken together, these factors lead to the development of damage and erosion of cartilage that then produces the symptoms of inflammation and pain that are seen in osteoarthritis. This medication is unique in that it contains both a viscosupplement and a steroid to provide rapid and long-lasting relief. These medications both have pain-relieving effects, but they work through different ways. The viscosupplement is a viscous gel-like substance that is injected to add or replenish synovial fluid in the knee joint, thus restoring lubrication, providing the afflicted joint with cushioning effects, and preventing further disease progression. On the other hand, the inclusion of a steroid, which in this case is triamcinolone hexacetonide, acts to provide short-term pain relief by mitigating inflammation, thereby reducing swelling and other symptoms of discomfort. As a result, the treated patient can gain long-lasting pain relief fast, allowing them to enjoy physical activities once again. Cingal is made of 88.0mg of sodium hyaluronate, 18.0mg of triamcinolone hexacetonide, 200.0mg of sorbitol, 8.0mg of polysorbate 80, 6.0mg of dibasic sodium phosphate, 1.2mg of monobasic sodium phosphate, and 4.0ml of USP water for injection q.s. When injecting Cingal, standard intra-articular injection site preparation and precautions should be used, and strict aseptic administration standards must be followed. Only medical professionals trained in accepted intra-articular injection techniques should inject Cingal for its indicated use. Before using Cingal, synovial fluid or effusion should be removed using an 18–20G needle. Use separate syringes for joint effusion and for injecting Cingal; however, the same 18–20G needle should be used for both purposes. Attach the needle to the prefilled Cingal syringe by first twisting and then lifting off the latter’s tip cap before securing the needle tightly while holding the luer hub. Do not apply excessive force when attaching the needle, as this may break the syringe tip. Inject the full 4ml dose into one knee. If bilateral treatment is needed, use a separate dose for the other knee. Use Cingal to provide patients with osteoarthritis in their knee relief from pain associated with the condition. Cingal is indicated for the treatment of pain in osteoarthritis of the knee. The treatment is administered through an intra-articular injection. Cingal can produce results beginning 24 hours after administration, and the effects have been shown to last up to 26 weeks. Cingal is the perfect treatment for patients with osteoarthritis of the knee that have the associated symptoms of pain and swelling and have not responded adequately to pain medication or exercise and physical therapy. Patients with a known hypersensitivity to hyaluronan products, triamcinolone hexacetonide, or any other allergies; pregnant or breastfeeding women; and patients with infections or skin diseases around the injection site should not receive Cingal treatment. Cingal is an easy and convenient treatment that combines a steroid and viscosupplement in one single dose. The steroid provides fast pain relief typically 24 hours after administration and has a greater potency than hydrocortisone without retaining any sodium. Furthermore, the hyaluronic acid gel of Cingal is able to provide up to six months of pain relief. Some patients experience transient swelling, bruising, redness, rash, or discomfort (pain, heat, itching, etc.) after an injection of Cingal. Other less common side effects include facial flushing, injection skin site atrophy, hypopigmentation, and calcification. Diabetic patients may see a temporary rise in their blood glucose levels. Rare side effects include tendinopathy and dermatitis. As with all injection procedures, Cingal administration carries the risk of infection.